Dog Cataract (Canine Cataract) Reversal in a Drop! Thirty dogs (60 eyes) received topical application of Can-C 1% N-acetylcarnosine eye drop solution daily to cataracts. Visual acuity of subjects improved within weeks of treatment. Cataracts shrank from the outside in. Discoloration of the lens became more transparent. Even dogs with long standing cataracts showed improvement in their sight. Can-C™ eye drops are a safe and natural alternative to cataract surgery. The research with dogs as subjects is undisputable: Vision improves and dog cataracts are reversed in most dogs. Can-C™ eye drops allow your dog's eyes to heal themselves due to their anti-inflammatory nature. Inflammation creates an imbalance in the eye that accelerates conditions such as cataracts. By reducing the inflammation, CAN-C™ provides a foundation that the eye needs to heal naturally. Nature's way is slower than surgery but it is far less invasive, less expensive and just as effective. Cataract surgery of course is an option for your dog, but it involves considerable expense and some risk. Of course, cataract surgery is not an option for many older dogs. Applying the Can-C™ eye drops to your dog's eyes does not involve the risk of surgical complications or side effects. Can-C™ drops improve the eyesight of dogs with cataracts because they restore the natural ability of the dog's eyes to heal. Why? Free radicals are controlled with the application of N-acetylcarnosine, Can-C's active ingredient. What Evidence Exists that Can-C™ Drops are Effective for Reversing Dog Cataracts? Remarkable improvements have been reported in the laboratory studies using dogs. 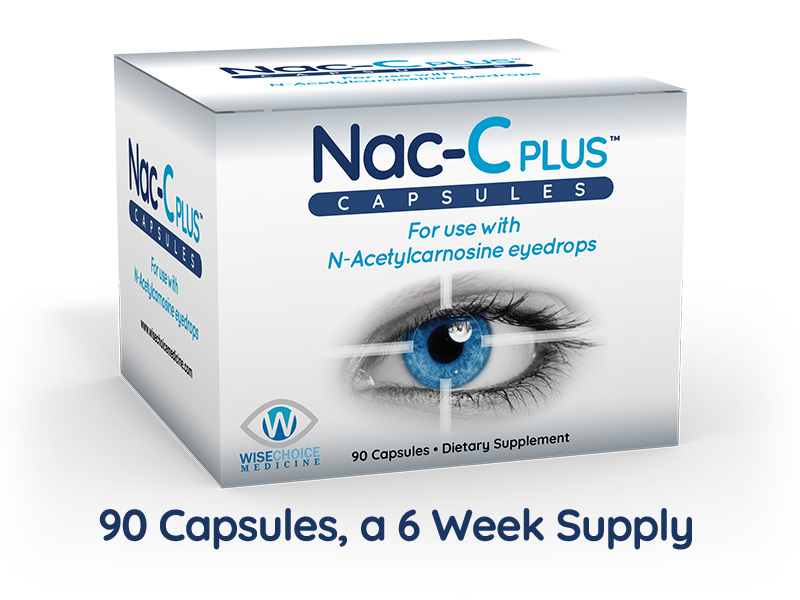 The high potency form of N-acetylcarnosine that is found in Can-C eye drops help to reverse cataracts and improve vision. Vita of Mark Babizhayev, Ph.D.
Why Does Can-C™ Succeed in Reversing Dog Cataracts? What causes cataracts in the first place? Research reveals that the rampage of free radicals in the eye are the culprit. When oxidation is out of control, proteins that are naturally found in the lens of the eye are cross linked and connected as if they were glued together. Scientists call this a glycosylation process. The end result is a yellowing or browning of the pigmentation in the lens of the dog's eyes. As the lens becomes more and more cloudy and as the discoloration becomes more pronounced, light that is able to reflect off of the retina at the back of the eye dims until no light is getting through, resulting in blindness. This process is usually a gradual one. It can take a number of months before the dog begins to bump into furniture or is hesitant to play outside. Dogs treated with insulin will often experience a rapid deterioration in their sight. If the oxidation process is left untreated, the dog's sight will gradually deteriorate. One day your dog can jump up on a chair. The next day they cannot. One day your dog can fetch a ball. The next day they can not find the ball. Your dog eventually can not see anything. There are many reasons that the oxidation process is triggered: exposure to ultraviolet light, toxins, pesticides, heavy metals and a wide variety of synthetic compounds, all of which contribute to an imbalance in the underlying conditions of the eye that are needed to keep it healthy. Dr. Mark Babizhayev posed the question: how do the conditions differ in a dog with cataracts and a dog without them? He discovered a simple but very eloquent answer: dogs with cataracts were seriously deficient in one primary anti-oxidant used by the body to fight free radicals: N-Acetylcarnosine. Dr. Babizhayev then posed the question: What if dogs with cataracts are given an eye drop that contains a high potency form of N-Acetylcarnosine? Will the inflammation be reduced? Can formation of a cataract be slowed or even stopped? His studies using dogs as subjects revealed startling results: Inflammation in the eye was reduced. Free radicals were reduced. The size of dog cataracts actually shrank. In 96% of the cases notable improvements were documented. The prime ingredient in Can-C™ is a high potency form of N-acetylcarnosine that has been carefully formulated by Japanese scientists to provide a maximum anti-oxidant protection for the eye. Through experimentation, Dr. Babizhayev's and his colleagues discovered that a potency which was too high or too low was actually not effective. Luckily, they were able to identify the correct molecular composition of N-Acetylcarnosine needed to facilitate the natural healing process. Since your drops were on back order I did order from another company because I wanted to start them as soon as possible. I did receive your shipment and am very glad I have a back up. I am a chiropractor and try everything natural before any allopathic intervation. My 16 year old yorkie mix has a cataract on her left eye that is pretty dense. The right eye was starting to go. She starting walking very slowly so not to bump into walls or furniture. I noticed she didn't want to stay outside, nothing seemed to matter but to sit or sleep. I think it might be just about over 3 weeks now and it is truly a miracle with her right eye. She looks out the car, she is walking all over the yard, I can waive from over 80 feet in my back yard and she turns and can see me. The other eye is starting to look darker like the color is coming back. I check it with a flash light and she squints now where before there was nothing. Even the woman at the park where we walk asked is that the same dog. So my good man and anyone who sells this thank you, thank you. The research program that led to the formulation of Can-C™ eye drops used today by thousands of dog owners was launched 11 years ago. Following the standard research protocol used to evaluate the effectiveness of all medicines and supplements, studies were first conducted in the lab using cell samples. After seeing promising results in the lab, the team of researchers launched the next phase of the research protocol: the evaluation of N-acetylcarnosine when applied to the eyes of dogs and rabbits with cataracts. Studies of dogs yielded surprisingly positive results. Acuity of vision improved rapidly. Cataracts shrank. The protein linkages were disentangled. Cataracts became more transparent. As a natural anti-oxidant, no side effects were expected and none were observed in the studies. Beneficial effects of the treatment held. The third phase of the research protocol used humans as subjects. Results were similar with one notable exception. Dr. Babizhayev found that the eyes of dogs are less defended than humans, so improvement in visual acuity was found to be quicker with canine subjects than when using humans as research subjects. "The treatment of age-related cataracts in canines and rabbits has been conducted and the efficacy of using N-acetylcarnosine for cataract treatment was established. The striking results in canines and rabbits for both cataract reversal and prevention of lens opacities are clear." The special formulation of N-acetylcarnosine that was found in the studies to be effective is currently manufactured in Great Britain under the highest manufacturing standards. The Can-C™ eye drops are used today by thousands of dog owners today to effectively treat their dog's cataracts. The recommended dosage for dogs is one drop in each eye at three different times during the day. It is important to keep the eye saturated with N-acetylcarnosine throughout the day so that your dog's eyes are protected from the damaging effects of oxidation and free radicals. As a natural anti-oxidant, Can-C™ has not been approved by the FDA. It is always a good idea to discuss with your veterinarian the use of any unapproved drug to treat your dog's cataracts. Question: I have been told that my dog is too small for cataract surgery. Can I use the Can-C™ drops on her? Yes indeed. Can-C™ has been used successfully on dogs of all shapes and sizes. The good news doesn't actually stop here. Some people use the eye drops to treat their other pets including parrots, rabbits and hamsters. Rest assured that the Can-C™ eye drops are a safe and effective alternative to cataract surgery even though the size of your dog's eyes is small. Question: Do dogs with newer cataracts have a better success rate with this product? If you begin applying the Can-C™ eye drops soon after noticing that a cataract has begun to form, you can generally expect quicker results. When a cataract has matured, it has likely already reached the stage of becoming somewhat hardened and calcified. As you can well imagine this makes it much more challenging for the dog's body to reverse the cataract. When the cataract has reached an advanced stage - when it has thickened and calcified - it typically does take longer to achieve optimum results. Question: Do your customers report a reversal in the size and density of their dog's cataracts with use of Can-C™ eye drops? Yes! We often receive phone calls and emails from customers who report their dogs are happier and more active. They offer reports of positive shifts in the behavior of their dogs first. After 2-3 months of use, they can usually see the cataract begin to shrink. Customers who do not use the product as instructed will likely not experience optimum results. It takes dedication and a steady commitment to apply the drops every day to your dog's eye, but persistence will pay handsomely. The end result depends primarily on whether the eye drops are applied to cataracts that are ripe - meaning they have been growing and thickening for some time - or if the Can-C™ eye drops are applied to eyes with cataracts that have just started to form. The outcome of course also depends on the consistency to which the eye drops are applied at three different times during the day. Recovery for dogs who have been injured or who are currently receiving insulin injections for diabetes also tends to be more challenging. Most owners report improvements in the size and density of their dog's cataract after 2-3 months of use. Optimal results are achieved within 6 - 12 months of use. Once the optimal level of improvement has been attained we always recommend that you apply only one drop a day to each of your dog's eyes (instead of three drops). This mitigates against the possibility that the conditions which seeded the cataract in the first place are not re-created by excessive oxidation. Question: What side effects can I expect from applying Can-C™ eye drops to my dog's eyes? None. The Can-C™ eye drops do not have any harmful interactions with any medicines your dog might currently be taking. There are no unwanted side effects. Application of Can-C™ eye drops does not induce any mineral or vitamin depletions in the body. Rather, the formulation of N-acetylcarnosine used in the manufacture of the Can-C™ eye drops provides your dog's eyes with the natural anti-oxidant protection that is needed to restore integrity to the conditions necessary to support healthy eyes and good eyesight. Can-C™ eye drops have been in widespread use for six years throughout every country in the world without any reported side effects or complications. The soothing antioxidant properties of Can-C™ eye drops make it possible for the dog's body to heal itself without inducing any unwanted side effects. Question. Are the Can-C™ eye drops approved by the FDA? Lubricants used in the Can-C™ eye drops (Carboxymethylcellulose sodium) and (glycerin) have been approved by the FDA for ophthalmic use. However, Can-C™ is not approved by the FDA for the treatment of dog cataracts. N-Acetylcarnosine (1%) is listed as an ingredient that is inactive on the product labeling. Question. What standards are involved in manufacturing the Can-C™ eye drops? Can-C™ is manufactured in a GMP certified, pharmaceutical facility which meets ISO 9001:2000 and ISO 13485:2003 standards for the design/formulation and manufacture of sterile contact lens solution and pharmaceutical solutions. The eye drops are manufactured in a GMP (Good Manufacturing Procedures) facility according to strict protocols issued by Dr. Mark Babizhayev and government manufacturing guidelines. Question. What are the chances that my dog's eyesight can be restored if my dog has become blind as a result of a cataract? In some cases dogs are able to better differentiate light and shadows better, but a restoration of sight after a dog has become blind is uncommon. Cataracts at this stage have ripened to the extent that they are significantly more resistant to the anti-inflammatory effects of Can-C™. Reducing inflammation and free radicals in the eye is not necessarily sufficient to clear the calcification that has formed and reverse the process which caused the cataract in the first place. Question. Is there any reason to even bother applying Can-C™ eye drops to my dog's eyes if she is now blind? Humans do not feel cataracts, but dogs feel cataracts as a constant irritant. That is why you may see your dog paw and scratch her eyes all the time. If you are a dog, having a cataract is like having sand caught in your eye which you can not rinse out. This irritation can be significantly relieved with use of Can-C™ eye drops. A dog that is now blind is also a target for infection. It is sometimes necessary to actually remove a dog's eyes in order to save her life. The application of Can-C™ eye drops reduces the chances of infection and the possibility the eye may have to be removed with surgery. It goes without saying that it is always advisable to follow the advice of your veterinarian in cases where the cataracts have become so problematic that your dog is now blind. Before the first day, my Popcorn was able to open his eyes all the way. I didn't realize they hurt, making him squint. He stopped that with the first dose, and by the next day he was running full tilt all over yard, even tho his cataracts are quite bad. Just the pain relief he experienced made us both feel good. Now, I am waiting to see how much the cataracts will shrink, given his age and how rapidly they grew. Q. To what extent are cataracts reversed with use of Can-C™? In many cases the cataract is fully reversed and vision restored. With a long lasting cataract that has "ripened", there is usually an improvement in eye sight. Complete reversal of cataracts is not possible in all cases. It really depends on the maturity of the cataract. When the cataract has hardened and calcified, it is more difficult to have a full recovery. Dr. Babizhayev, as a veterinarian I want to let you know that I am now recommending N-acetylcarnosine (Can-C™) for the treatment of canine cataracts. After applying Can-C™ eye drops to the my 15 year old miniacher pinscher, "Skeeter", for one year, the cataract in his right eye has diminished! I have come to the conclusion that your cataract eye drops are a modern scientific miracle for our pets. From my observations it has prevented Skeeter from going blind and improved his overall aging experience! If your pet has cataracts ask your veterinarian or a pet ophthalmologist about this amazing product. Question: How will I be able to tell if the product is working or not? It is very difficult to tell if a human being has a cataract without an eye examination. Dog cataracts however are easy to see with the naked eye. You are encouraged to track the pace of shrinkage over time. What can you expect to see as the cataract is reversed? It will shrink in size and become smaller. Your dog will likely experience an improvement in their peripheral vision before they are clearly able to see objects in front of them. 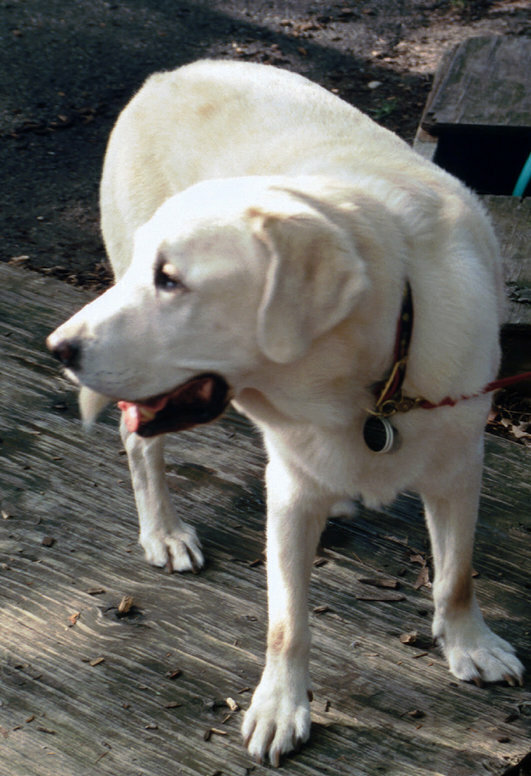 Dog owners tell us that they observe a marked improvement in the behavior of their dog first. They become happier and more joyful as the irritating grind of the cataract is softened and their peripheral vision improves. They have much greater confidence to run and play as they used to do before sight became problematic because of cataracts. The first sign they are working is a marked improvement in their behavior. The second sign they are working is a shrinkage in the size of the cataract. It is always a good idea to have your dog's eyes checked regularly by a veterinarian so that you can track the improvement as it unfolds. Question: Will my dogs cataract come back again after it has been reversed? Yes. when the conditions in the eye that created the cataract in the first place are re-created in the dog's eyes, it is very likely that another cataract will appear in one or both eyes. A new cataract can actually form relatively quickly since the underlying conditions that created the cataract in the first place are likely to still be present. Once the cataract has shrunk sufficiently and your dog has resumed his or her normal routine, we suggest that you reduce the dosage to one (1) drop in each eye daily. This will be sufficient to prevent the oxidation that created the conditions which caused the cataract originally. Question: How long will each box of Can-C™ Eye Drops last? Each box of Can-C™ contains two 5ml vials and each 5ml vial contains approximately 75 drops. When used to treat cataracts, one box of Can-C™ will last three to four weeks. Three (3) drops applied to each affected eye daily will last 25 days. When used as a preventive or maintenance measure only one drop in each eye daily is needed. When used to prevent the formation of new cataracts one box of Can-C™ will last 8 - 10 weeks. Question. Will the drops cause any discomfort or stinging in my dogs eyes? Many dog owners tell us that their dogs beg for the drops because they feel so soothing and comforting to their eyes. The PH levels of Can-C has been formulated so that it has the optimal balance of alkaline and acidic properties. Question. My dog's cataracts are a result of diabetes. Will Can-C™ help her? It will probably take longer for you to see visible signs of improvement. Cataracts in diabetic dogs can be initially resistant to treatment. Owners tell us that improvements are generally found within two months after beginning treatment as long as the drops are consistently applied as directed. It is impossible to offer a precise estimate of the time required for the cataract to reverse because the effects of diabetes slows the healing process down as does the presence of mature cataracts that have ripened to the point of becoming more resistant to treatment. It also helps to space out the times between when the drops are applied and the insulin is given. It is best not to give the insulin shot at the same time that you apply the Can-C™ eye drops. Question. I have found another web site that sells N-acetylcarnosine eye drops. What is so great about your N-Acetylcarnosine eye drops? It is actually not just the presence of N-Acetylcarnosine in the eye that makes reversal of cataracts possible. As it turns out, the specific grade of the N-Acetylcarnosine used has to be of a highly specific purity factor. Dr. Babizhayev's research revealed that only a particular purity factor was effective when addressing cataracts effectively. This is the only formulation that has been shown in the controlled clinical environment to shrink cataracts and, equally important, safe for long term use. Other formulations of N-Acetylcarnosine sold in the marketplace have a wide range of grades and purity factors, none of which have been observed in the clinical setting to reverse cataracts and even more importantly tested for safety in long term use. How can you be certain that you have obtained the Can-C™ approved formula? Look for the following statement on the label of any product you have purchased. "Approved by Innovative Vision Products"
This of course is the product you will receive when you purchase through us. Each box of Can-C™ contains two 5ml vials and each 5ml vial contains approximately 75-drops. You also receive a set of instructions with each shipment. 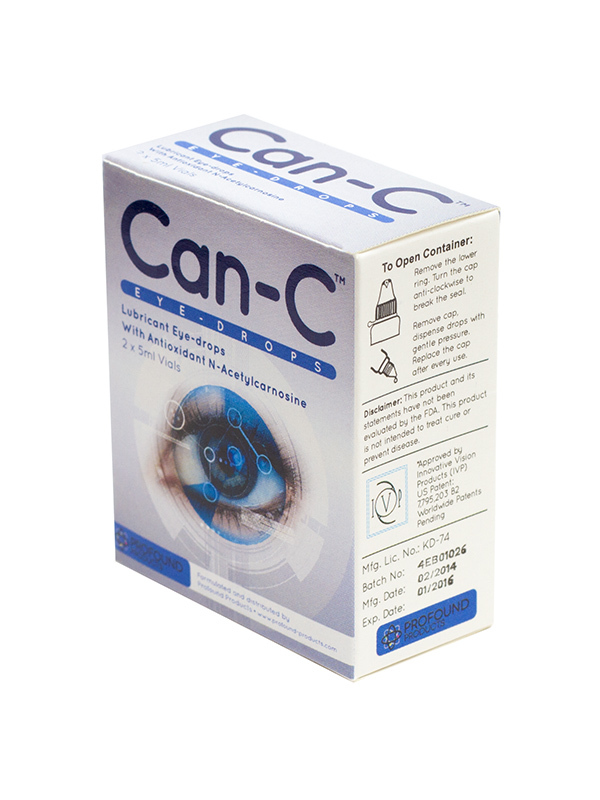 Can-C™ eye drops at a price several dollars less than our price. Now if price is your only criteria - go for it. But before you launch a search for a better price, we want you to know the difference between ordering from us - we are a small business - and ordering from a large company that has a slightly lower price. 1. Our company is located in Olympia, Washington, USA. All of the profits from sales of Can-C™ stay in the USA. 2. Our staff is comprised of one person - Robert. He cares about the well being of your dog and your family. 3. When you call the toll free number [877-526-4646] Robert answers the phone. If he is talking with another customer when you call, he will answer your call promptly. Feel free to test this out before you order! 4. We always put tracking numbers on all shipments - so you will always know precisely where your shipment is at from the moment it is ordered. 5. Shipping is free on all orders to US destinations is free. Shipping to destinations outside the US is $6.95. 6. We ship out orders the same day they are received. 7. Shipping is by first class mail. Deliveries arrive in the USA within 2-3 days. Shipments to foreign countries can take one to two weeks depending on custom delays. .
8. You can always call our toll free number 877-526-4646 and get your questions answered. Robert answers any and all questions about the eye drops. He is in a unique position to find answers to any questions you may have given he has been in communication with over a thousand dog owners who use Can-C eye drops to treat dog cataracts. In short, if price is your only criteria, our competitor will not hesitate to take your order. Every time we lower our price - our competitor lowers their price. We cannot compete on the basis of price, though I think you will discover our prices are competitive. . . If the services listed above appeal to you, we will be most happy to answer your questions and process your order. Order two boxes for $39.00 per box or $78.00 for two boxes. Two boxes will last approximately six weeks when applying three drops in each of your dog's eyes daily. Shipping to US destinations is free. Shipping to destinations outside the US is $6.95. We accept all major credit cards. Click on the link below to order using a credit card or Paypal. Order three boxes at $35 per box for a total of $105. Each box contains two 5 ml vials so you will receive a total of 6 vials in all. Three boxes will last approximately 9 weeks when applying three drops in each of your dog's eyes daily. Shipping to US destinations is free. Pay using Bill Me Later with no interest charges for six months on purchases of $99 and more. Shipping outside the US is $6.95. Click on the link below to order using a major credit card or Paypal. Order four boxes at $35 per box for $140.00. Each box contains two 5 ml vials so you will receive a total of 8 vials in all. Four boxes will last approximately 12 weeks when applying three drops in each of your dog's eyes daily. Shipping to US destinations is free. Shipping outside the US is $6.95. Click on the link below to order using a major credit card or Paypal. Order six boxes at a discount of $31.50 per box for $189.00. Six boxes contain a total of 12 vials in all with two 5 ml vials in each box. Six boxes will last approximately 18 weeks when applying three drops in each of your dog's eyes daily. Shipping to US destinations is free. Shipping outside the US is $6.95. Click on the link below to order using a major credit card or Paypal. Reversal of your dog's cataracts is a natural process that takes time. Your dog is the one doing the healing. Dr. Babizhayev formulated a supplement which can be used to speed up the effectiveness of the Can-C eye drops. This supplement, Can-C Plus, contains a unique set of anti-oxidants. You need only put the contents of one capsule twice a day in your dog's food for maximum results. We especially recommend that you give your dog the Can-C Plus in their food when applying the liquid Can-C eye drops to their eyes at three different times during the day if your dog has chronic health problems such as diabetes or has mature cataracts which have calcified. The Can-C Plus supplement treats your dog's entire body, not just their eyes. It helps protect your dog from the cellular damage of free radicals and reduces damage caused by oxidation throughout their body. The Can-C Plus supplement was formulated to help prevent carnosine in the Can-C eye-drops from being broken down. This increases the potency of the Can-C eye-drops and the length of time they remain active in your dog's eyes. While the cost of shipping Can-C Plus is $3.00 to US destinations and $9.95 to destinations outside the US. Surgery on your dog's cataracts is obviously an option, but consider the safe alternative - allowing your dog's cataract to heal naturally. May your dog's eyes shine brighter with each passing day. P.S.- CAN-C is a natural product that helps your dog's eyes heal naturally. Reduce the inflammation. Cut down on the free radicals. Give your dog a chance to see better without resorting to cataract surgery. Spam is commercial email or unsolicited bulk mail (also called junk mail) which has not been requested by the recipient. We do not condone or engage in Spam and do not tolerate Spam of any sort. The privacy of individuals who enter information on our shopping cart (1shoppingcart.com) to order the Can-C eye drops or any other products listed on this website is considered to be confidential and private. All personal information you enter on our shopping cart order forms (such as your name, e-mail, mailing address, phone, etc.) is never sold, shared, traded or revealed or given to any individual or organization for any reason. All products are purchased through our shopping cart which is a 100% secure payment gateway (https). We also treat all personal information we have about customers that may have been obtained through e-mail correspondence, snail mail or telephone to be strictly confidential. We do not sell, share, trade or reveal personal information to any individual or organization for any reason.